Weekend Kits Blog: DIY Quilt Kit Giveaway at Weekend Kits! The May Craft Kit Giveaway has ended - be sure to check back for future giveaways - we'll be posting another one very soon. The winner of the May Craft Kit Giveaway is Wondermom. Congratulations! Please Contact Us with your shipping information and we'll have your prize out to you right away. Thanks to everyone who entered the giveaway and joined us on our new Facebook page. Please stop by now & then for updates on new product arrivals, store promotions, and giveaways! It's time for the May Craft Kit Giveaway at Weekend Kits. You can enter to win one of the Simple Quilts DIY Quilt Kits from Fabric Editions. All the premium quality fabrics you need to create a designer lap quilt that doubles as a decorative sofa throw! 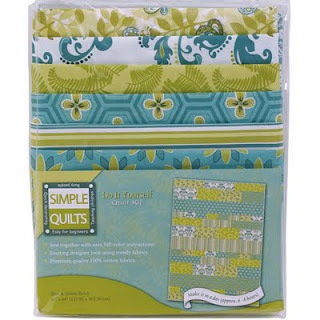 One winner will be randomly selected to win the Blue & Green DIY Quilt Kit. It's OK if you're new to quilting, Simple Quilts are easy for beginners. They're also a super-convenient option for busy quilters. 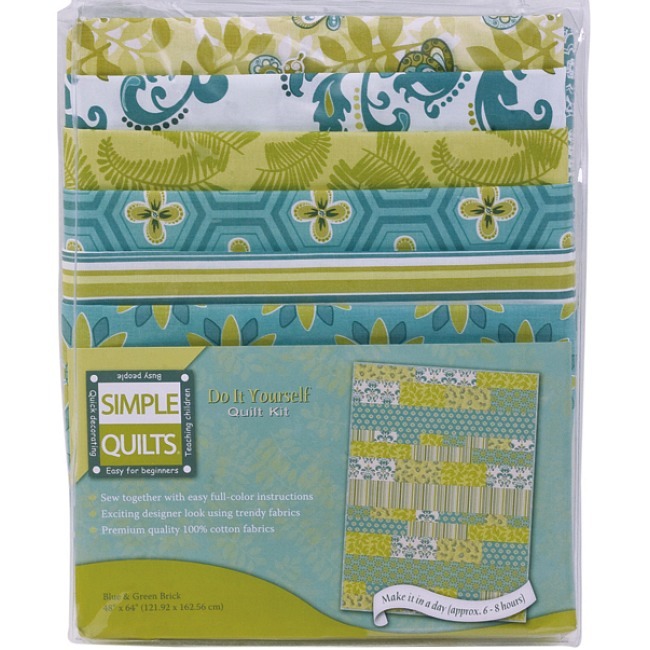 This kit includes all the fabrics you need to make the entire quilt! 1) "Like" Weekend Kits on Facebook AND leave a comment here - on this blog post - letting us know that you did. 2) If you already "Like" us on Facebook (or you don't have a Facebook account), just leave a comment here telling us about one of your favorite kits at Weekend Kits. • You have until Thursday, May 19 at 12:00pm (EDT) to enter. • One winner will be chosen using Random.org's number generator. The winner will be announced here on Friday, May 20. We don't collect email contact information at time of entry, so it's important that you check back here to see if you won! It might be helpful to add a reminder to your calendar. Winner will have 48 hours to Contact Us with their shipping info before another winner is drawn. If you've always wanted to give quilting a try or you're an experienced quilter looking for your next quilt project - this is the perfect kit to get you started. Good Luck Crafters! I've done a few of the cuddly quilt kits and really liked how they turned out. I'd love to try my hand at thiss quilt, it looks beautiful! I've tried a fw of the cuddly quilt kits and really like how they turned out. I'd love to try my hand at this kit - it looks beautiful! I just "liked" you on Facebook. I looked at all of the quilt kits - love the black and white! I like the beaded jewelry kits and the quilt kits are awesome! Love the beaded jewelry kits and the quilt kits are awesome! I am now a facebook fan, this would be my first quilt, I love fabric But it seems intimidating to make a quilt, but I would love to try!! I posted and I am waiting with baited breath! This will be my first quilt! I have a new grandbaby on the way, this kit would be great. If I don't win, I'll probably buy one anyway. My favorite kits right now are the punch needle kits - love them. I have a new grandbaby on the way and this quilt would be perfect. Even if I don't win I'll probably buy one anyway,because I love your kits. My favorit kits to date are the punch needle. I have a grandbaby on the way and this quilt would be perfect. Even if I don't win, I'll more than likely buy one. My favorite kits so far are the punch needle kits. I have liked you on Face Book. The Quilt would make a great gift. I like Weekend Kits on facebook and I LOVE the baby quilts! This is a beautiful kit. I hope I win it!! I liked you on facebook. Love the kits! I was #74 to "like" Weekend Kits on Facebook! I just "liked" you on Facebook. I am going back this afternoon to look through all of the quilt kits. Thanks for the opportunity to win. I just liked you on FB so glad to have found you! the kit is adorable!! I like you on Fb, and I like easy quilt for beginner, log cabin Star. I like Simple Quilts - Quilt Kit for Beginners - Black & White and the Patchwork Pups. I have liked you on Face Book. The Quilt would be wonderful. Fabulous giveaway. Love it that this looks simple! A good beginner quilt project. "liked" you on FB - I made the cutest baby quilt from one of your quilt kits and it turned out great! I would love to try something bigger! I like your mini-quilt Cup of Coffee kits. Perfect for a quick gift! Thanks for the non-facebook option. I like the Plush Animal Sewing Pattern & Fabric Kit - Cute Kitty. Love the Cuddly Baby Quilt Kit in Night Owl! I am a new fb follower - emillie rose. Beautiful! I'd love to tell my grandkids (when I get them) a yarn about when I stitched this beauty together! I love your kits. Great Giveaway. Thanks. So many cute things. I think the Plush Animal Sewing Kit "Cute Kitty" is especially sweet. Thanks for the giveaway. love the Counted Cross Stitch Kit - Birth Record - Barn Babies. what a cool idea! We have a winner! Congratulations to Wondermom. Please Contact Us and we'll have your prize out to you right away. Thanks to everyone who left comments here and joined us on our new Facebook page. I loved reading through all of your comments! It was great to see that many of you are just getting started in quilting. Please post your quilt projects on our Facebook page - I'd love to see what you've made. If you ever have any quilt related questions, please let me know, and I'll do my best to answer, or at least point you in the right direction.